Lift 1A was used for the women's World Cup slalom race on Saturday. 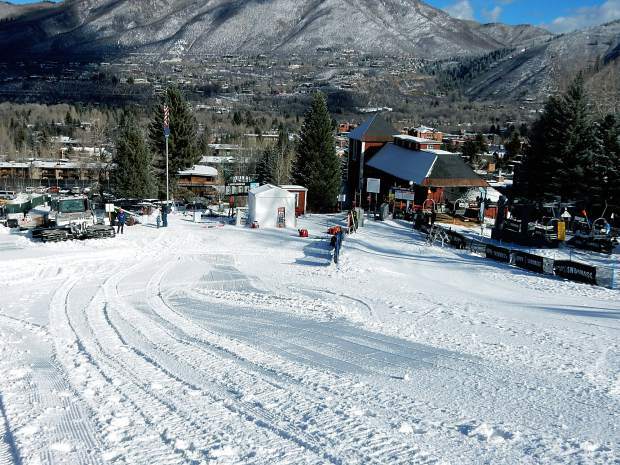 Aspen Skiing Co. is working on a plan to replace the chairlift. A group of partners are proposing a hotel to the left of the lift terminal. The team behind the Gorsuch Haus project will unveil specific plans Thursday for the hotel they believe will help transform the base of Lift 1A into something the community and the International Ski Federation (FIS) want to see. The final numbers of the project are being worked out, but Jeff Gorsuch said the hotel will have some 60 rooms and a handful of units for sale. The project will be discussed at a public event at 5 p.m. Thursday at the Limelight Hotel. Gorsuch said an application will be submitted to the city of Aspen within a few weeks. Gorsuch’s group has an option to buy property from Aspen Skiing Co. When looking up the mountain, the hotel would be to the right of the current Lift 1A lower terminal and extend uphill to the bottom of the Norway Trail. It will be developed by Norway Island Partners, which includes Gorsuch, Bryan Peterson and Jim DeFrancia of Lowe Enterprises. Gorsuch said he is thrilled about the prospects of a facility that would engage the community on that side of the mountain again. The hotel will host public events, feature a restaurant and be an inviting place that’s befitting the race history on the west side of Aspen Mountain. “The heart of the community is there,” Gorsuch said. He noted that Aspen Mountain has hosted more than 400 races that were sanctioned by the FIS or U.S. Ski Association. However, the FIS has warned Aspen Skiing Co. officials that Lift 1A and the surrounding base no longer live up to the World Cup brand. The lift is a slow, double chair and some of the base area buildings are ramshackle. The FIS’s concerns could put Aspen’s hosting of the 2017 World Cup Finals at risk (see related story on page A1). Gorsuch, who is a member of the World Cup Finals organizing committee, is trying to make sure through personal correspondence that FIS officials are aware of the changes that are coming at the Lift 1A base. A developer has broken ground on a townhouse project further down on Aspen Street. A stalled hotel project that is approved but unbuilt has changed hands. That project also is located on Aspen Street at the site of the Skiers Chalet. Gorsuch Haus won’t be constructed by the March 2017 World Cup Finals. “I don’t think that’s mathematically or humanly possible,” Gorsuch said. Nevertheless, he believes the project is indicative of Aspen’s interest in making that portal to the mountain more viable. The partners intend to meet their affordable housing and parking obligations. Few variances will be sought during the review process, according to Gorsuch. “It’s a very intimate project that’s right-sized for the base of the mountain,” he said. He thinks the plans for the Lift 1A side will create a base area that matches Aspen Mountain’s top-notch setting for racing and Aspen’s ability to host an event.